I feel like at LSE we have a very specific notion of what it means to have fun. We sit down for coffee and start talking about internet infrastructures, one hour later we see ourselves talking about trains. No wonder that some of the most exciting things happening on campus are the public lectures, open events that everyone can join and that are later converted into podcasts. 1.Is post-modernism to blame for the post-truth world? When I first attended this lecture I thought that philosophers were the craziest type of people alive. I actually created a new challenge for my friends in which I would randomly ask: Would you rather live forever only able to speak in metaphors or live forever only speaking like a very intellectual philosopher? But today, I actually re-listened to it, and it got me even more inspired than before. They are speaking about the so-called postmodernism as a new era of human thinking in which we have to think beyond what is truth and what isn’t. They also discuss the role of science in this new moment and whether or not science has to be accessible and aim to reach out to people or be held on a pedestal away from common knowledge. I selected a little quote from it that I can safely say changed my life forever. Maybe because I didn’t understand the rest of it at the time (there it is, I said it). And she says: “an umbrella” – or a rose, I don’t remember which one it was. The point of it was that he could find a pattern in the stars of anything that she mentioned, it wouldn’t matter what it was. And of course that’s the case since there are enough patterns in the skies to make anything. But we don’t think that the umbrella is in the stars. We don’t think that this is what they really are. But that doesn’t mean to say it isn’t useful. Now, six months after this, I could start going on and on about Habermas and the public sphere and rationality. What can I say? I am interested in fake news! Unlike the previous one though, this talk was very straight to the point. The New York Times has become some sort of symbol given its turbulent relationship with Donald Trump and we were very eager to go to this talk by the NYT director Mark Thompson because of that. It didn’t disappoint. There are still many points that we could question, such as the full extent of the media structure and how the new shape of journalism actually enabled Trump’s election. But he did talk a lot about the world we are living in, how we speak, how the progressist language and discourse played a role in the mess that we are currently in. Mary Robinson is the ex-president of Ireland and worked as a high commissioner for human rights at the UN. Her credentials alone are already breathtaking, but what really matters here is that when we speak of climate change we need to think about it from bottom-up. This talk introduced the concept of climate justice as a framework for doing just that. It was quite a nice talk, the best part were the questions in the end, I feel like that’s when she truly shared her experience as a head of state and later as a key part of the negotiations for the Paris Agreement. Dr. Muhammad Yunus is beyond any need for introduction. He is a Nobel Prize winner and in this talk, he shared the story of his initiatives in Bangladesh and his ideas to fight poverty and inequality. Although very inspiring, I am not completely sure of how much I think that this is a feasible and pragmatic model. Again I think that the best part of the talk is when he answers questions and one of the first ones was about the amount of state intervention that would be needed if his dream was to come to life. There is some food for thought there. This is a lecture by some scholars that I really admire. 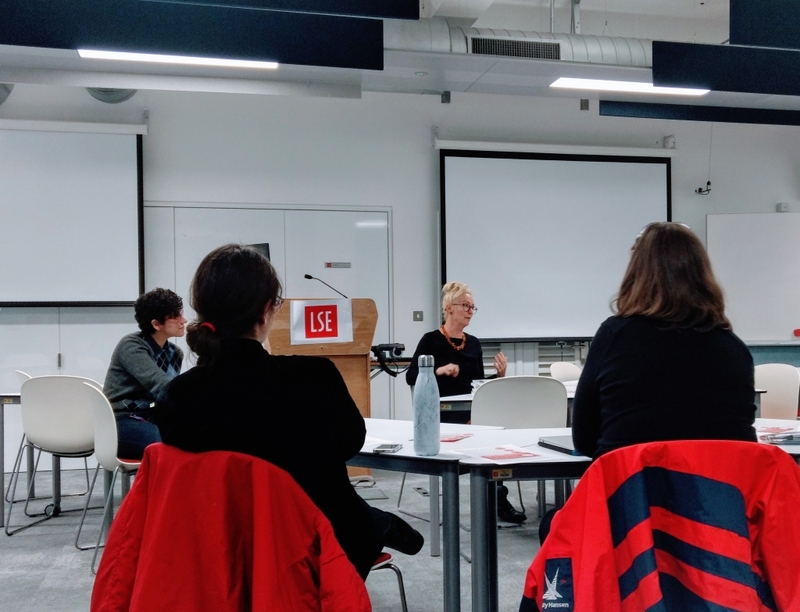 Dr. Bev Skeggs is brilliant, I later went to another talk she gave at LSE Life on feminism and class and she answered a question I asked about choosing “class” as a category of analysis in a society that struggles with racism, such as Brazil, and she was very approachable. Dr. Seeta Peña Gangadharan is my dissertation supervisor and I have already mentioned her indirectly when I talked about the best lecture I went to since I got to LSE here. I didn’t know Professor Mike Savage at the time, but I have been reading some of his work for my dissertation and he is in some of my favorite public lectures. This talk happened just last week and in it, Dr. Brian Klaas brought a nice summary of Donald Trump’s first year as president. But beyond that, he also analysed what makes an authoritarian regime and what are the things that characterize a democracy. The message that he brings is that democracy is something that you only notice when it is gone. This is another somewhat very philosophical lecture and it was quite nice. I don’t think that I would have attended something like this if I was not here at LSE because it is not a topic about which I am particularly passionate. It was great to step outside the box and expose myself to something different. This was a lecture with an author, Eimear McBride, and a professor, Dr Kaye Mitchell, in which they talked about writing and consciousness flux. It was very interesting because they discussed writing from the perspective of the body and the sensations and feelings that connect the bodily sensations and the reader. It also talks about language and how we configure language to express feelings and emotions. This was another very nice talk with the president of the Ford Foundation, Darren Walker, in which he discusses the role of private capital in promoting equality. It is an interesting talk, also a little bit controversial. But very coherent, in the sense that he presents a valid perspective. Very much in sync with Muhammad Yunus’ lecture.